My Favorite Recipes 7.0 is food & drink software developed by RB59.com Software. This is the perfect computer Recipe Software. If you want to save your family recipes, start your own collection, or if you just want to own the easiest to use computer recipe software available, this is it! 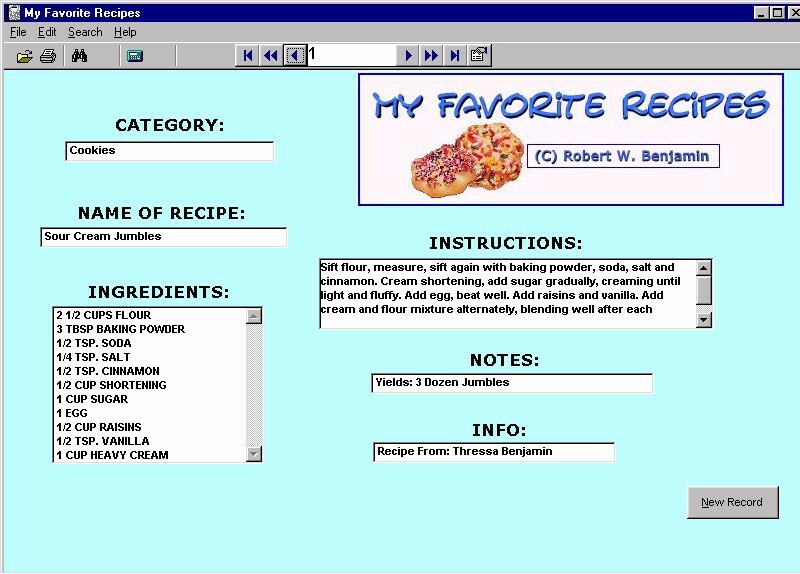 You just enter the information about each recipe, and that's it, it's auto saved, and your ready to enter another recipe. You can search by recipe names, such as: cookies, or title, or search by ingredients. This home & hobby software is shareware, which means you can download and use My Favorite Recipes 7.0 for free during the trial period (usually for 30 days). At the expiration of the period you will have to buy the food & drink product for $9.99. My Favorite Recipes 7.0 is available at regnow and RB59.com Software website. My Favorite Recipes 7.0 supports different languages (including English). It works with Windows 98/XP/Vista. We have tested My Favorite Recipes 7.0 for spyware and adware modules. The software is absolutely safe to install. Our website has thoroughly tested home & hobby product My Favorite Recipes 7.0, written the review and uploaded installation file (863K) to our fast server. Downloading My Favorite Recipes 7.0 will take several seconds if you use fast ADSL connection. Yum! is a recipe organizer with the following features:Dynamic searching of recipe text - found set of recipes updated as you type the search terms.